Bring your bricks to life! 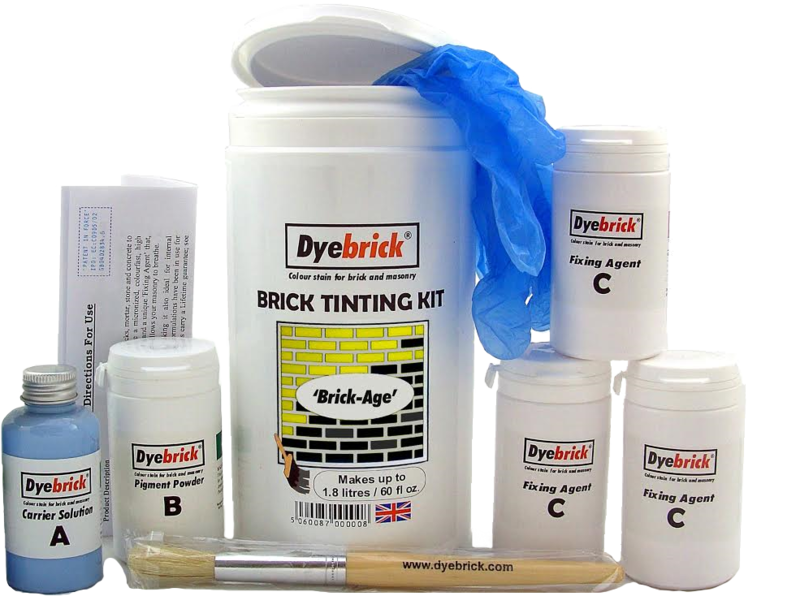 The Dyebrick Brick Tinting Kit is a three-part mixing system designed for the DIY enthusiast to produce a natural, permanent colour modification to brick, mortar and a variety of masonry surfaces. 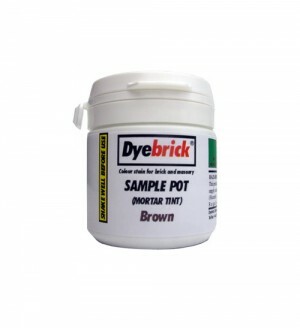 PLEASE NOTE: Although Dyebrick works on most brick types, we recommend that you try our Sample Pots first, to ensure that the desired colour and shade can be achieved and that the dyes can 'fix' to your masonry. Please Note: Refunds are not available for orders of 4 Kits or more due to ‘over-ordering’ practices. It is imperative that when tinting large areas that you first assess the colour, shade and coverage by trying our sample pots or individual Tinting Kits. Dyebrick is a consumer product and is not for trade use. The Dyebrick Guarantee does not cover the trade use or application of our products. Companies wishing to source trade products should visit our commercial page. 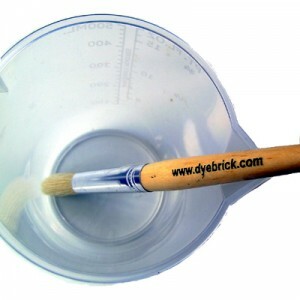 Sample Pots contain 100ml of Dyebrick product and are made up individually every day. 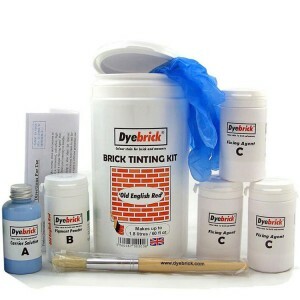 They are supplied as a tint solution that mimics the initial dilution of our Standard Brick Tinting Kits. They can then be diluted to reach the required shade or blended with other sample pots to produce specific colours of your choice. If you want to remove any test areas, then you do not need to add the Fixing Agent. This way if you are not sure about the colour then it can be removed using a small electric pressure washer or by using clean water and a proprietary brick cleaner. However, we still recommend testing on a small inconspicuous area first. 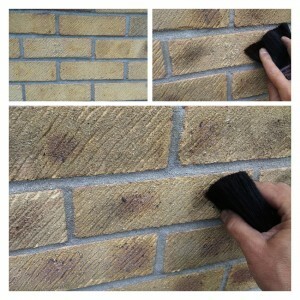 Please note: Even after cleaning there may be a slight colour residue visible on some masonry types. 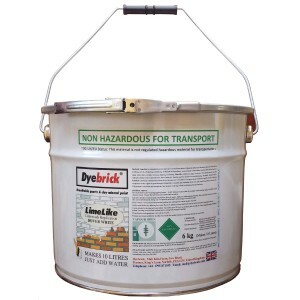 Dyebrick is not guaranteed or recommended for application to horizontal surfaces subjected to wear or pedestrian traffic. SYRINGE: You can also choose to add a syringe to your order. This is helpful when ordering multiple sample colours as you can accurately measure your mix proportions when creating colour blends. Our products are shipped at a zero rate for destinations outside the European Union. However, by law, you will be liable for Duties and Tax charged at your Country's rate. 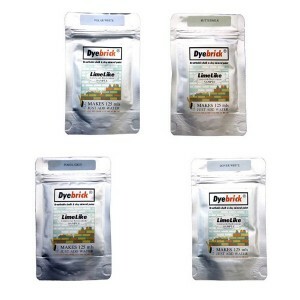 Dyebrick is a consumer product and is not for trade use. Companies wishing to source trade products should visit our wholesale page. 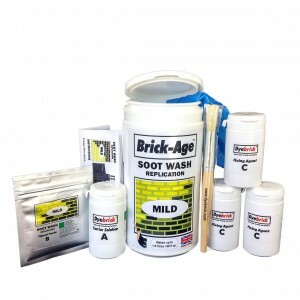 Brick -Age Soot Wash Replication - MILD is designed to produce an aged look to masonry. It darkens the brickwork creating a mild, natural, older appearence. For more information please see the Brick-Age website. The main ingredients include, a colourfast high intensity black iron oxide pigment, a high-grade carbon black pigment, a proportion of old London soot, an effective water-based ‘Carrier Solution' and a unique 'Fixing Agent’ that, when blended, will produce a durable and natural finish that allows your masonry to breathe. Can be used neat or can be diluited to create the desired effect. Ideal for toning down newly replaced London Yellow Stock bricks etc. Up to 45 sq.metres of brickwork can be covered by one Brick-Age Kit. Each Kit comes with detailed instructions covering a range of applications. IMPORTANT: Sootwash Replication should only be used on untreated brickwork. It should not be applied to old blackened brickwork or brickwork that has previously been ‘sooted’. Sample panels must always be carried out first to assess the effects that can be achieved with your particular brick type. Some bricks may contain soluble salts that could result in a 'milky haze'. 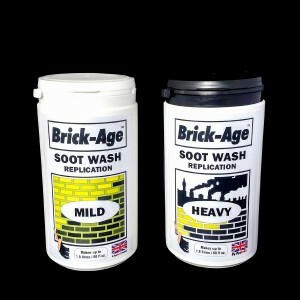 Soot Wash must only be applied to dry brickwork. 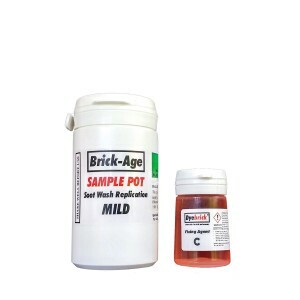 This Sample Pot of Brick-Age contains 100ml of Soot Wash Replication. It is supplied as a tint solution that mimics the initial dilution of our Soot Wash Replication MILD. It can then be diluted to reach the required shade. One 20ml vial of 'Fixing Agent' is supplied with each sample pot ordered. This is used to ensure that the final product will be compatible with your masonry and will not rub or wash off. 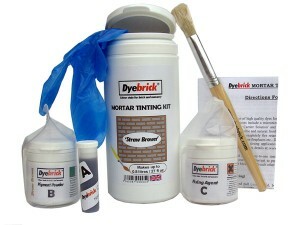 The Mortar Tinting Kit is smaller than the Brick Tinting Kit and is designed for modifying the colour of hardened mortar joints. It bonds with cement-based mortars to produce a durable natural finish that allows the joint to breathe. Available in 4 popular mortar colours. Please note: These are approximate values and are based on smooth-struck mortar joints with an average absorption rate. 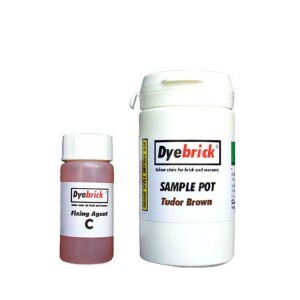 Sample Pots contain 50ml of the Dyebrick mortar tinting product. They are supplied without the Fixing Agent so if you are not sure about the colour then it can be removed using a small electric pressure washer or by using clean water and a proprietary brick cleaner. However, we still recommend testing on a small inconspicuous area first. Please note: Even after cleaning there may be a slight colour residue visible on some mortar types. Lightener is now available in this new powder pack. All you need to do is add water! 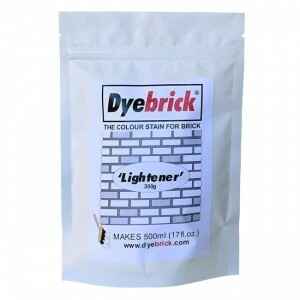 Lightener can be added to any Dyebrick stain to produce paler colours. Lightener can be used for creating small-scale lime- wash effects. You can also create slight milky washes (for aging techniques) by diluting further with water. The maximum this can be diluted by is 2 times it original volume (1 litre). For further dilution you will need to purchase more Fixing Agent. Please Note: Dyebrick when added to browns can produce pinkish - purple tones due to the reaction of the white with the red/black elements within those colours. So please test prior to full application. Ideal for most brick tinting jobs, with good bristle length and the width will easily accomodate most brick profiles. SOOT WASH Replication is available in two shades. MILD: is designed to to produce an authentic aged look to brickwork and masonry, it darkens the brickwork creating a mild, natural, older appearence. Mild is the shade that should be chosen for most brick ageing jobs. Please try a sample pot first. For more information see our Brick-Age website. HEAVY: (for shades similar to 10 Downing Street) is much stronger and will replicate heavy, black, carbon-based pollutants prevalent in London and many Northern industrial towns and cities. For more information, please visit the Soot Wash website. IMPORTANT:Sootwash Replication should only be used on untreated brickwork. It should not be applied to old blackened brickwork or brickwork that has previously been ‘sooted’. SOOT WASH Replication sample pots are available in two shades. PRODUCT INFORMATION: Sample Pots of Soot Wash Replication contains 100ml of liquid product. It is supplied as a tint solution that mimics the initial dilution of our Soot Wash Replication products, they can then be diluted to reach the required shade. 1 x 100ml pot of Fixing Agent. The standard Brick Tinting Kit contains 3 x 100ml Fixing Agent pots so you will only require extra pots if you are diluting the product to produce very pale shades or to create colourwashes. 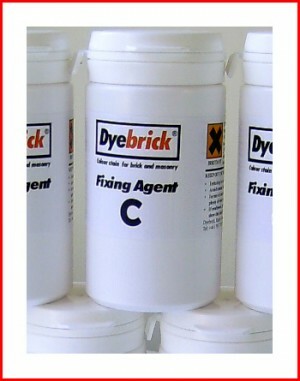 Dyebrick Fixing Agent chemically fixes the colour solution to your masonry. It is an integral additive and must be added to the colour solution prior to application. The addition rate if adding to sample pots is: 5:1 Tint:Fixing Agent. 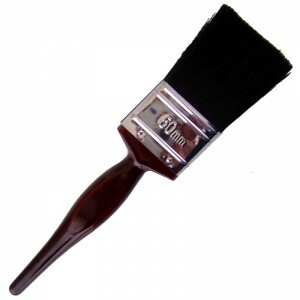 Pure bristle paint brush, specifically designed for mortar joint profiles. Limelike is an authentic limewash replication, but without the lime! 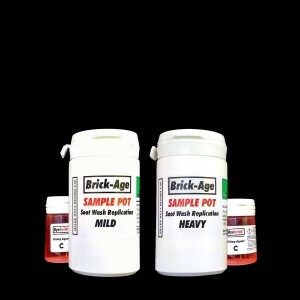 PLEASE TRY OUR SAMPLE POTS FIRST TO ASSESS THE DEGREE OF ADHESION TO YOUR BRICK/MASONRY. YOU WILL ALSO BE ABLE TO SEE THE EFFECTS THAT CAN BE ACHIEVED WITH YOUR PARTICULAR BRICK TYPE. PLEASE NOTE: LIMELIKE SHOULD NOT BE USED ON PAINTED MASONRY OR MASONRY THAT HAS BEEN SEALED OR TREATED WITH WATER PROOFERS. 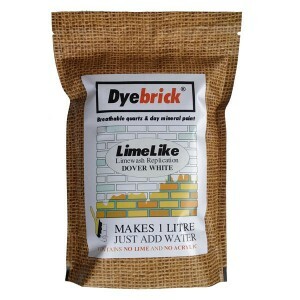 LimeLike by Dyebrick, is a durable lime-free alternative to old limewashes. Limewash effects can be easily achieved without the problems of rub-off, dusting and flaking when using on internal and external building materials. A careful blend of English white clay, quartz and mica, together with pure mineral silicate binders. LimeLike contains no cement. There are no acrylics, solvents, spirits, or any other types of synthetic binder used in our product: We have kept it simple and natural. LimeLike will produce a more creamy solution than standard lime and is easier to apply with roller or brush, without dripping or running. LimeLike is 'vapour open', so allows your bricks to breathe. It resists wind driven rain, but does not prevent water vapour to pass through it. LimeLike Sample Sachets contain 75 grams of LimeLike powder. Just add water to produce 100mls of LimeLike product. LimeLike contains powdered mineral fixatives so is very difficult to remove. Please test on an inconspicuous area to assess the effects that can be achieved with your brick type or masonry. One sachet will cover about 60 bricks (approx. 1 square metre) of average porosity. One sachet will cover about 35-40 bricks of high porosity. One sachet will cover about 100 smooth dense bricks. LIMELIKE SHOULD NOT BE USED ON PAINTED MASONRY OR MASONRY THAT HAS BEEN SEALED OR TREATED WITH WATER PROOFERS. 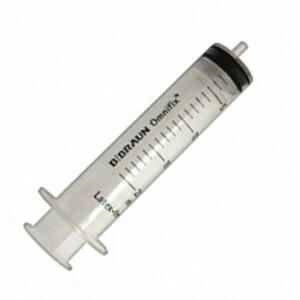 20ml Syringe: You can also choose to add a syringe to your order. This is helpful when ordering multiple sample colours as you can accurately measure your mix proportions when creating colour blends. ‘After-Tones’ in a 50ml sachet, enables you to add highlights and character to newly tinted bricks to either mimic original organic deposits e.g. algae, lichen and moss, or produce mock 'lime bloom', carbon deposits or efflorescence. A small amount of the liquid should be poured onto a wooden board or artist's palette, then brushed-in and spread until it starts to dry upon the brush. The nearly dry material can then be rubbed into the brick surface to produce 'distressing' techniques.